You're just about ready to walk out the door. You have your purse, keys and the grocery list in hand. You call your child, and as she darts around the corner towards the front door you realize she has swapped out her trendy mama made outfit for...that #@!$$%%^&^* princess costume AGAIN! UGH!!! I hear moms everywhere nodding heads. We've all been there, and whether it's Halloween time or any other time of the year, little kids love to play dress up. And why shouldn't they? It's FUN to pretend to be someone else! 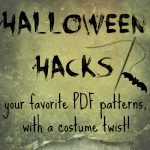 Today we're bringing you Halloween Hoodie Hacks as a part of the Halloween Hacks Blog Tour. We're featuring the Rachel and Jackson patterns by Funktional Threads and various embroidery and applique designs to make practical dress up outfits for your kids. You can get 30% off your cart at Funktional Threads now through midnight Sunday, October 19 with the code PRHOODY30. For the Seamless Hood Download, join the Funktional Threads Pattern Group. Perfect for Halloween Dress Up or for Every Day Play! Combine any Funktional Threads Hooded Pattern with an Applique Design, sew with costume coordinating fabrics, and "Viola"...Your hoodie has been hacked. I love this idea because it perfectly combines practical with playful. All we did was take an existing PDF pattern, choose fabrics to match our themes, and add a matching appliques to the hoods to complete our looks. Easy Peasy. Perfect for Halloween Dress Up or for Every Day Play! It's both functional (or in this case Funktional) and whimsical. He sure makes a cute Rudolph! The perfect solution to saving your sanity and preserving their imaginations at the same time. a-w-e-s-o-m-e, awesome, awesome, awesome are we! Aren't these just so fun? I know not everyone has an embroidery machine, but there are so many ways you can still get creative with hand cut applique or embroidery too! Argh!!!! I can wear this hoodie on Halloween, or to the grocery store with mom anytime. Even the Ice Queen approves! Want to make your own? Enter to win! Pin any image in this post on Pinterest and use the hashtag #hoodiehack. 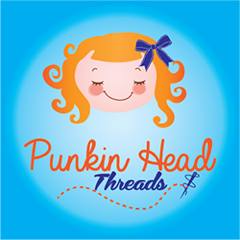 We'll pick 2 winners Sunday night 10/19 at 10 PM to receive a copy of the Funktional Threads Pattern of their choice and a $5.00 embroidery design credit. Happy Pinning!